Umer Akmal is in full swing not because of the arrival ofworld cup but there is one more reason to it. The famous middle order batsman Umar Akmal is going to have a master blaster Cricket World Cup 2015 as a blessing has arrived at his doorstep. 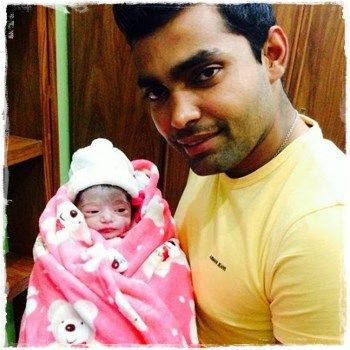 Umar Akmal’s wife Noor Amna is blessed with a baby girl. The team player shared the big news on the micro-blogging site twitter with a picture of his newly born baby girl born on Thursday. Umar Akmal is the younger brother of wicket-keeper batsman Kamran Akmal. Kamran Akmal married to Noor Amna daughter of former Pakistani leg spin master Abdul Qadir in Lahore last year. Umar Akmal is a part of final squad of world cup 2015, will be leaving for the world cup destination Australiaand New Zealand next month. Umar’s excitement for this beautiful addition in his family will definitely boost his performance in coming Cricket World 2015.